TAUNTON, Mass. – It has been a remarkable two-year run for King Philip. The Warriors have won back-to-back Kelley-Rex division titles in dominating fashion, leading the league in goals scored and fewest goals allowed both years, and won a Div. 1 South crown in 2018. The quest to repeat as sectional champions came to an abrupt end on Thursday night in the semifinal at Taunton’s Tiger Aleixo Stadium, as the Warriors gave up three straight goals, including two in two minutes, against Somerset-Berkley and lost 3-1 in a rematch of last year’s South final. There was plenty of excitement surrounding this matchup of two of the top programs in the state, and a little bit of controversy as well. The Raiders have two boys, Alex Millar and Lucas Crooks, in the starting lineup and there has been a debate raging about whether or not that is fair to other programs. The question was put to the KP coaches after Millar scored the game-winning goal on Thursday and Crooks added the insurance goal that sealed the victory, but both wanted to focus on the play of their team and not on something that can’t be changed. It was an end-to-end game, played at a pace that few teams in the state would be able to match for a full 60 minutes. KP had an early chance to try and break the deadlock with Nicole Connor finding Alli Meehan off a corner and she quickly swung it to Katie Lindmark for a shot that was just wide of the post. Somerset had a good look minutes later when Crook got in behind the KP defense off a pass from Megan Salsinha, but he couldn’t put his shot on target. Meehan again got going with a winding run through the defense and her shot into the middle was redirected just wide by freshman Meghan MacDonald. Camryn Crook had a good look at goal in the 17th minute but pressure from KP defender Emma Izydorczak put her off enough that the shot went wide. Millar also went close with a powerful backhand shot off a corner. Meehan drew a save with six minutes left in the first half and the rebound came to Connor but her effort hit the side of the goal. A minute later and the Raiders missed a golden opportunity when Salsinha stole the ball on the restart and broke free only to rifle a shot wide when clean through. Lucas Crook had another good chance just after halftime when he stole the ball in the attacking zone, but Grace May came up with a big kick save. MacDonald nearly fashioned a good chance for KP when she took it off Millar’s stick and tried to hit Abby Nixon right in front, but again it went wide. The breakthrough finally came in the 39th minute. Meehan picked out Claire Lawler on the left side of the goal. Lawler played it back to Meehan in space and she was able to draw a save our of Madison Ferrara. The rebound went right back across goal to the far post, where Lawler was ready for the tap in. Rather than give KP a momentum boost, the goal seemed to spark the Raiders into life and Somerset-Berkley quickly turned the game on its head. In the 45th minute, Camryn Crook forced May into a save and Millar drew another good save off the resulting corner but finally on the third try Salsinha managed to knock in a rebound and tie the game. All the energy was with the Raiders and they quickly went back to work in the attacking half of the field, earning another corner. The ball was played out to Millar and he fired a shot into the mass of players in front of the goal. It took a deflection off a KP stick and looped into the top corner of the net for what turned out to be the game-winner. KP tried to push and get back into the game, but the Warriors were struggling to create clear chances against the Somerset-Berkley defense. In the end, it was the Raiders that would add another goal. Lucas Crook drove across the crease onto his backhand and he fired a shot into the far corner. King Philip finishes the season at 18-2-1. Oliver Ames, 12 @ Norwood, 28 – Final – Click here for a photo gallery from this game. 1st Quarter: (N) Solomon Klarou 5-yard rush, Jay Wladkowski XP good. 2nd Quarter: (N) Marc Murphy 51-yard pass to J. Wladkowski, J. Wladkowski XP good; (OA) Nathan Cabral 29-yard rush, 2pt rush failed. 3rd Quarter: (OA) Cam Perron 1-yard rush, 2pt pass failed. 4th Quarter: (N) M. Murphy 32-yard pass to J. Wladkowski, J. Wladkowski XP good; (N) Jason Denehy 12-yard pass to Tim Denehy, J. Wladkowski XP good. #3 Mansfield, 1 vs. #14 Plymouth North, 0 – Final (2OT) – Click here for a Recap and Photo Gallery from this game. #7 Franklin, 1 vs. #10 BC High, 2 – Final – Click here for a recap and photo gallery from this game. #3 Milford, 3 vs. #14 Bishop Feehan, 1 – Final – Milford scored a pair of goals in the first 10 minutes while keeper Josh Orellana made a key save to preserve a one-goal lead and the Hawks went on to pick up the win. Jordan Borges’ left-footed strike from 35-yards out just over two minutes into the game set the tone for the Hawks. Joao Vitor Neiva netted his first goal just minutes later, finishing off a service from Tiago Carvalho at the back post. Feehan scored in the 14th minute to get within one and Orellana made a terrific kick stop in the final minutes of the first half to preserve the lead. Neiva notched his second goal of the game in the 72nd minute to secure the victory. Milford will host the winner of #6 Oliver Ames and #11 Walpole on Tuesday at 6:00 at Milford High. #12 King Philip, 0 @ #5 Mansfield, 2 – Final – Click here for a Recap and Photo Gallery from this game. #8 North Attleboro, 0 vs. #9 Weymouth, 2 – Final – Weymouth scored once in each half to pick up the win, putting an end to an impressive Rocketeer season. Sam Hawkins, Emma Gaulin, Kayla Pasquel, Ashlyn Gaulin, and Hayley Ferrin all played well for North Attleboro, which finishes the season at 12-3-4. #11 Franklin @ #6 Hingham – Postponed to Sunday, 11/4 at 6:30. 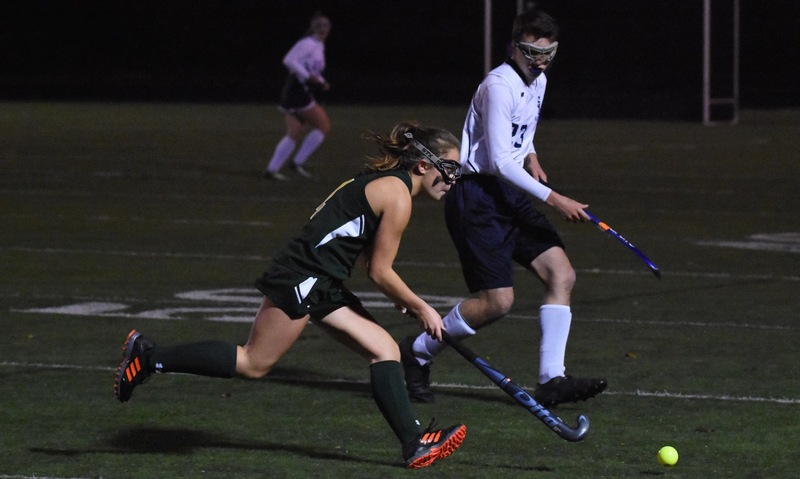 #3 King Philip, 3 vs. #14 Norwood, 1 – Final – Norwood scored with 15 minutes left to cut the King Philip advantage to just one goal but Claire Lawler scored her second goal of the game to give the Warriors some breathing room. King Philip built a 2-0 lead behind goals from Lawler and Nicole Connor. “It was a huge team effort, both offensively and defensively,” said KP co-head coach Kim Meehan. The Warriors advance to the D1 South Quarterfinals to take on #11 Barnstable (13-5-2) on Monday at 3:45 at home. #7 Canton, 2 vs. #10 Duxbury, 1 – Final (OT) – Canton senior Katie Trerice scored on a penalty stroke six minutes into the overtime period to lift the Bulldogs to a win. Maggie Malloy opened the scoring in the first half, a lead that the Bulldogs took into the second half. Duxbury tied the game with just under 10 minutes to play and Canton defended back-to-back corners with no time left in regulation to force overtime. With the win, Canton advances to play #2 Somerset-Berkley (18-1-0) in the D1 South Quarterfinals on Monday at 6:00 at Somerset-Berkley High School. #13 Franklin, 3 @ #4 Notre Dame Academy, 1 – Final – Franklin goalie Christina Luccini had a terrific game in net, making nine saves, and the Panthers scored a pair of second half goals to earn the upset on the road. Cassi Ronan gave the Panthers the lead with just under four mintues left in the first half but Notre Dame Academy answered less than two minutes later to tie the game 1-1 at half. Ashley Reutlinger put Franklin ahead midway through the second half with an unassisted tally, and Ronan added an insurance goal on a penalty stroke with just over five minutes to play. Franklin advances to the D1 South Quarterfinals to play #5 Plymouth North (16-3-0) on Monday at 4:00 at Plymouth North High School. 1st Quarter: (B) Carlens Jean 27-yard field goal; (F) Nick Gordon 32-yard pass to Jack Nally, Parker Chevrant XP good. 2nd Quarter: (F) P. Chevrant 23-yard field goal; (F) N. Gordon 10-yard pass to Sean Leonard, P. Chevrant XP good; (F) Safety. 4th Quarter: (F) N. Gordon 1-yard rush, P. Chevrant XP good. 1st Quarter: (CM) Barrett Pratt 16-yard pass to Hunter Tully, Thomas Leonard XP good; (CM) Darius Leclair 2-yard rush, XP blocked. 2nd Quarter: (CM) B. Pratt 30-yard pass to Brian Stubbs, Owen McGowen 2pt rush; (CM) Zach Mitchel 53-yard rush, Matt Sokol XP good. 3rd Quarter: (CM) B. Pratt 21-yard rush, M. Sokol XP good; (A) Jason Weir 1-yard rush, Colby Briggs XP good. 4th Quarter: (CM) B. Pratt 20-yard pass to B. Stubbs, M. Sokol XP good; (A) Justin Cote 94-yard kickoff return, XP failed; (A) Kevin Velazquez 44-yard fumble recovery, XP failed. 1st Quarter: (M) Aidan Sacco 38-yard pass to Makhi Baskin, XP failed. 3rd Quarter: (BR) Anthony Morrison 56-yard rush, XP good. 4th Quarter: (M) Vinnie Holmes 12-yard rush, A. Sacco 2pt rush good; (M) Michael DeBolt 8-yard rush, M. DeBolt XP good. 1st Quarter: (KP) Ryan Halliday 4-yard rush, Cole Baker XP good. 2nd Quarter: (B) Michael Tellier 1-yard rush, XP good; (KP) R. Halliday 1-yard rush, C. Baker XP good; (KP) Robbie Jarest 38-yard pass to David Morganelli, C. Baker XP good. 1st Quarter: (NA) Brendan McHugh 18-yard rush, Tyler DeMattio XP good. 2nd Quarter: (WH) Rian Schwede 5-yard pass to Nate Beath, Jake O’Brien XP good; (NA) Nick Raneri 2-yard rush, T. DeMattio XP good; (WH) Ethan Phelps 7-yard rush, XP blocked. 4th Quarter: (NA) B. McHugh 5-yard rush, T. DeMattio XP good. 1st Quarter: (D) John Roberts 11-yard pass to Will Prouty, XP good. 2nd Quarter: (D) J. Roberts 15-yard pass to W. Prouty, XP good. 4th Quarter: (D) Tim Landolfi 12-yard rush, XP good; (S) Jeff Grier 18-yard rush, Jeff Cocchi XP good; (D) Jack Jacobson 42-yard rush, XP good; (S) John Burke 64-yard pass to Christian Ais, J. Cocchi XP good; (D) J. Roberts 15-yard pass to Ryan Prudente, XP good. 1st Quarter: (C) Brendan Albert 2-yard rush, Owen Lehane XP good; (C) Kyle Fitzgerald 5-yard rush, O. Lehane XP good. 3rd Quarter: (H) Andrew Carroll 60-yard pass to Drew Berard, Robbie Barrett XP good. 4th Quarter: (C) Johnny Hagan 13-yard pass to Jace Emma, XP missed; (H) Ethan Ritchie 66-yard rush, XP missed; (C) K. Fitzgerald 1-yard rush, O. Lehane XP good. 1st Quarter: (Fal) Jake Murphy 10-yard rush, J. Murphy 2pt rush; (Fox) Mike Luong 2-yard rush, Liam Foley 2pt pass to Brian Derba. 2nd Quarter: (Fal) J. Murphy 5-yard rush, Kyle Connolly 2pt rush; (Fox) L. Foley 15-yard pass to Shayne Kerrigan, 2pt pass failed. 4th Quarter: (Fal) J. Connolly 9-yard rush, 2pt failed. 1st Quarter: (M) James Wilder 80-yard kick off return, Cameron Lund XP good; (M) Colby Gonser 3-yard rush, C. Lund XP good. 2nd Quarter: (M) Jimmy Cosolito 10-yard pass to Luke Slavick, C. Lund XP good. 3rd Quarter: (OA) Nathan Cabral 5-yard rush, Jake Erlich 2pt rush; (M) C. Gonser 5-yard rush, XP failed. 4th Quarter: (OA) N. Cabral 3-yard rush, Cam Perron 2pt pass to Ethan Eckstrom; (M) Luke Eilberto 3-yard rush, C. Lund XP good. Milford, 2 vs. Hopedale, 0 – Final – Milford scored once in each half to pick up a win at home over non-league rival Hopedale. Jordan Borges picked up where he left off from his game-winner against Canton, putting the Hawks up 1-0 in the first half on an assist from Leo Coelho. In the second half, junior Walisson de Oliveira doubled the lead on an assist from Joao Vitor Neiva. Lucas Caetano had a strong game defensively and Cam Doherty recorded the shutout in net. North Attleboro, 3 @ Attleboro, 0 – Final – North Attleboro won the Blue-Red Cup behind two goals and an assist from Ashlyn Gaulin. Alex Moulson was also on the board for the Rocketeers, who got a team-record 10th shutout from goalie Emma Noreck. Morgan Silver, Bri Westcott, Sam Hawkins, Lydia Hershey, Liz Smahi and Olivia Bishop all had strong games defensively in front of Noreck. Stoughton, 0 @ Sharon, 1 – Final – Sharon scored with 11 minutes to play to earn a win over Stoughton. The Black Knights thought they had the equalizer in the final minute but the goal was waved off for offside. Stoughton coach Tara Daniels said Nicole Weir had an outstanding game defensively for the Black Knights. Stoughton, 1 @ North Attleboro, 3 – Final – Grace Cole, Jessica Stratham, and Hannah Alarie each scored once as North Attleboro earned a win at home over visiting Stoughton. Alanna McCormick scored for the Black Knights. King Philip, 5 @ Algonquin, 0 – Final – King Philip built a 2-0 lead by halftime and finished strong with three goals in the second half. Meghan MacDonald (from Dana Truini) opened the scoring just over a minute into the game and then set up Abby Nixon five minutes later to go up 2-0. In the second half, Nicole Connor and Alli Meehan set each other up three minutes apart to increase the lead to 4-0. Claire Lawlor capped the scoring with 10 minutes to play on a feed from MacDonald. Canton, 3 vs. Quincy, 1 – Final – Canton fended off a comeback attempt from the Presidents of Quincy High, earning a 3-1 win at home (25-18, 25-18, 24-26, 25-18). Erin Devine had nine kills and six blocks to pace the Bulldogs at the net while Taylor Harris and Liz Bickett combined for 18 kills. Megan McDonough was amazing on defense with 22 digs and Nicole Brown continued her strong season with 25 assists and 10 digs. King Philip, 0 @ North Quincy, 3 – Final – King Philip went on the road and suffered a 3-0 setback (21-25, 22-25, 13-25). For the Warriors, Catherine Waldeck had 11 kills and two blocks and Lily Carlow finished with five digs. Oliver Ames, 1 @ Brockton, 3 – Final – Oliver Ames won the second set to knot the score at 1-1 but Brockton prevailed in the next two sets to get the win (17-25, 25-12, 12-25, 12-25). Jordan Bosse paced OA with 12 digs, eight kills, and a pair of aces. Sadie Homer added 37 digs, Allie Kemp finished with 22 assists, and Jackie Raymond chipped in with six blocks. Stoughton, 3 @ Cardinal Spellman, 0 – Final – Stoughton wrapped up the regular season with a sweep of Spellman. Molly Turner and Delaney Nagel combined for 23 kills and Amaya Morris (six blocks) and Mia Bennett (22 digs) provided strong defense for the Black Knights. Hanna Holden had 10 assists in the win. Mansfield, 9 @ Stoughton, 0 – Final – Mansfield senior Steph Kemp was involved in over half of the Hornets’ goals, helping her side clinch at least a share of the Kelley-Rex division title. It marks the third straight division title for Mansfield, who can win it outright with a draw or win against Taunton. Kemp scored a hat trick and had two assists, Cassidy McMahon added a goal and two assists, and Kerina Geminiani finished with a pair of goals. Melissa Reef, Sarah Sacco, and Kerrin Sears also scored for Mansfield. Taunton, 0 @ Oliver Ames, 6 – Final – Click here for a Photo Gallery from this game. Anna Tempestoso (on her birthday), Erin Holmberg, and Brianna Gibson each scored a pair of goals as Oliver Ames recorded a big win at home, giving head coach Britt Sellmayer his 400th career win. Tempestoso scored the first two goals of the game, Holmberg found the back of the net twice in a row, and Gibson scored two straight as OA led 6-0 at half. Attleboro, 1 @ Franklin, 7 – Final – Attleboro scored early in the second half to cut Franklin’s lead in half but the Panthers responded with five goals in a 15-minute span to earn a big win. Cassi Ronan and Regan Paterson (from Amanda Lewandowski) scored in the first half to give the Panthers a 2-0 lead at the break. Alex Compton scored for Attleboro to make it 2-1 just two minutes into the second half. Franklin responded with goals from Victoria Quinn (from Paterson) in the 41st minute, Ashley Reutinger (from Lewandowski) in the 45th minute, Paterson just 17 seconds later, Lewandowski in the 50th minute, and Ronan in the 55th minute. Christina Luccini and Anna Jardine each had three saves in net. Milford, 0 @ Canton, 3 – Final – Canton’s Maggie Malloy paced the Bulldogs to a shutout win over Milford. After a scoreless first half, Malloy scored a natural hat trick in the second half to help Canton earn the win. Oliver Ames, 0 @ King Philip, 2 – Final – King Philip took the lead just over a minute into the game but didn’t add to its total until the final five minutes of the game. Claire Lawler scored an unassisted goal 1:19 into the contest but neither side found the back of the net over the next 50 minutes. Nicole Connor added the insurance goal on an assist from Meghan MacDonald with 4:59 to play. Sharon, 0 @ Stoughton, 6 – Final – Stoughton’s Morgan Lessa scored her first career goal as the Black Knights rolled to a win at home. Haley Nelson led the Stoughton offense with three goals while Allie Howe found the back of the net twice. Taunton, 4 @ Mansfield, 2 – Final – Taunton built a 2-1 lead by halftime and never relinquished that advantage on its way to a 4-2 decision over Mansfield. The Tigers had four different goal scorers as Alana Tavares (assist), Jillian Pagliuca, Hannah Blackwell, and Cierra Bartel each found the back of the net. Lauren Torres had two assists and Emma Sheehan made five saves in net. Attleboro, 0 @ Franklin, 3 – Final – Franklin completed its undefeated regular season (17-0) with a 3-0 win over visiting Attleboro (25-9, 25-14, 25-11). Ellie Wisniewski (three aces) had a team-high eight kills while Peyton Arone (two aces), Hailey Sanders, and Lily Galluccio had six kills apiece. Lauren McGrath finished with 26 assists while Emma Clifford ended the game with an ace for the Panthers. Milford, 0 @ Canton, 3 – Final – Canton clinched the Davenport division outright, its 10th title in the last 11 years, with a 3-0 (25-23, 25-10, 25-10) win over Milford. Nyah Claiborne played great with 14 service points, including three aces and six digs, Rose Hazam added four kills and had a strong game at the net, and Nicole Brown continued her stellar senior year with 21 assists and three kills. Oliver Ames, 3 @ King Philip, 1 – Final – King Philip got back into the game with a close third set win but Oliver Ames closed the match out with a big win in the fourth set (25-13, 25-14, 25-27, 25-11). Allie Kemp had a strong game for OA with 40 assists and three aces. Sadie Homer added 38 digs and four aces, Jordan Bosse had 17 kills and six aces, and Grace McCallum finished 12 digs and seven aces for the Tigers. For King Philip, Nicole Coughlan and Catherine Waldeck each had seven kills. Taunton, 2 @ Mansfield, 3 – Final – After going up 1-0, Taunton rallied for a 2-1 lead but the Hornets won the final two sets to prevail 3-2 (25-16, 11-25, 20-25, 25-14, 15-5). “All of our seniors played a great game,” said Mansfield head coach Melissa Heeden. Abby Sullivan had eight of her 17 service points in the last game to help the Hornets get the win. Greenly Kelly had eight kills and eight service points, Katie Dardinski added five digs and six service points, and Meg Haradon finished with 10 service points. Sharon, 1 @ Stoughton, 3 – Final – Stoughton overcame a 1-0 deficit to earn a win over visiting Sharon. Delaney Nagel led the Black Knights with 14 kills and 10 blocks, Molly Turner had 10 aces and 16 digs, and Mia Bennett was strong on defense with 26 digs. Stoughton, 0 @ North Attleboro, 2 – Final – North Attleboro scored a pair of goals inside the final 10 minutes to grab two points against visiting Stoughton. Joe Hilf put the hosts ahead in the 75th minute, finishing off a corner kick from Joey Coscarella that was flicked on by James Sales. The Rocketeers grabbed a second in the 77th minute when Sales headed in a cross from Hilf on a short corner. North head coach Geoff Burgess said Evan Rosenberg and Gavin O’Malley played strong defense while Kyle Briere made two saves in the win. Stoughton goalie Carter Gerome made eight saves for the Black Knights. Taunton @ Oliver Ames – Postponed to a date and time to be announced. North Attleboro, 8 @ Stoughton, 1 – Final – North Attleboro senior Ashlyn Gaulin had her hand in six goals to help the Rocketeers open their season in style. Gaulin scored three goals and assisted on three more while Kayla Pasquel had a goal and two assists. Lily Cameron added two goals, Haley Ferrin and Lexi Sinacola each found the back of the net once, and Liz Smahi had an assist. Stoughton sophomore Rebecca Desousa scored off an assist from classmate Mackenzie Manning. Oliver Ames @ Taunton – Postponed to a date and time to be announced. King Philip, 4 @ Acton Boxboro, 1 – Final – King Philip raced out to a 3-0 lead at halftime and never looked back in a win over Acton Boxboro, ranked #4 in New England by MAX Field Hockey. Dana Truini opened the scoring just over four minutes into the game, deflecting in Alli Meehan’s shot off a breakaway. Meehan doubled the lead with an unassisted goal and then set up freshman Meghan MacDonald at the midway point to make it 3-0. MacDonald grabbed her second goal of the game off a pass from Claire Lawlor. Grace May had a solid game in net for the Warriors. Attleboro, 0 @ Norton, 3 – Final – Attleboro was in every set but fell on the road to Norton (25-19, 25-18, 25-22). Jessica Matheson had three digs and two assists, Ana Leonardo had seven assists and an ace, and Chelsea Calcagni finished with five kills and two aces for the Bombardiers. Canton, 161 @ Milford, 170 – Final – Canton’s Thomas Singleton fired a 38 to earn match medalist honors and help the Bulldogs open the season with a win. Chris Lavoie and Mike Gobbi each shot 41 while Tommy Dimock rounded out Canton’s scoring with a 42. Justin Applebee led Milford with a round of 40. Franklin @ Foxboro – Postponed to a date and time to be announced. Franklin, 4 @ Attleboro, 0 – Final – Franklin junior Jackie Cherry struck out nine in a complete game shutout to lead the Panthers to a win on the road. Franklin scored a pair of runs in the first, built a 3-0 lead in the second and tacked on an insurance run in the seventh inning. Ally Shea went 2-for-2 with an RBI and Maddie White reached base twice, scored once, and had an RBI. Franklin’s Peyton Arone helped end an Attleboro threat in the fourth, making a catch in left and getting a double play at second.